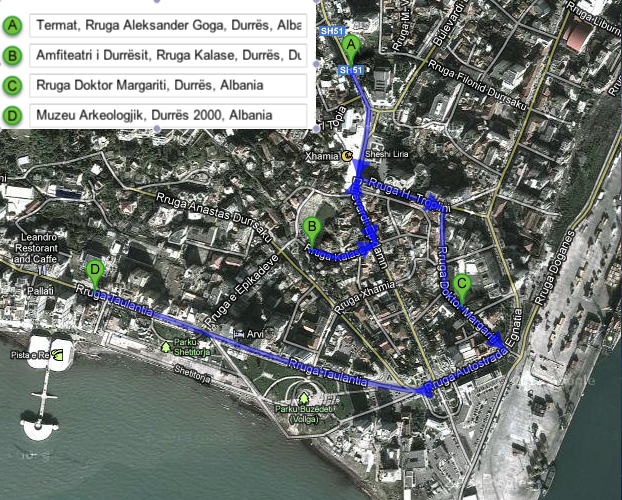 Below is how I would spend a day in Durrës, Albania. This entry was posted in Durrës Guide and tagged Albania, Alisa Nemirovska, Amfiteatri i Durrësit, Amphitheatre, Archaeological Museum, Archaeology, architecture, arts, Backpacker, Backpacking, Banja Romake Termike, Byzantine Forum, City Guide, Cricket’s Aunty, Day Trip, Durres, Forum Bizantine, google maps, History, Kulla Veneciane, Museum, Musuem, Muzeu Arkeologjik, Rail, Roman Thermal Baths, Sample Itinerary, Self Guided Walking Tour, Solo, Tirana, Travel, Travel Blogger, Venetian Tower, Walking Tour on February 4, 2013 by Cricket's Aunty. Below is how I would spend a day in Tirana, the capital city of Albania. This entry was posted in Tirana Guide and tagged Albania, Alisa Nemirovska, Archaeology, architecture, arts, Backpacker, Backpacking, Bell of Peace, City Guide, Clock Tower, Cricket’s Aunty, Day Trip, Enver Hoxha, Fortress of Justinian, George Kastrioti Skanderbeg, google maps, History, Kalaja e Justinianit, Kalaja e Tiranës, Kulla e Sahatit, Matyrs’ Cemetery, Mother Albania Statue, Mother Teresa’s Statue, Museum, Musuem, Muzeu Historik Kombëtar, National Library of Albania, National Museum of History, National Theatre of Opera and Ballet of Albania, Palace of Culture, Pallati i Kulturës, Piramida, Qendra Nderkombëtare e Kultures, Sample Itinerary, Self Guided Walking Tour, Sheshi Skënderbej, Skanderbeg Monument, Skënderbej Monument, Sky Club Panoramic Bar & Restaurant, Sky Tower, Solo, Statuja e Nënë Terezës, The Pyramid, Tirana, Tirana Castle, Travel, Travel Blogger, Varrezat e Dëshmorëve të Kombit, Walking Tour on February 1, 2013 by Cricket's Aunty.